The three Macron East Sussex Football League knockout competitions took centre stage on Saturday. All of the scheduled second round ties were completed on a wet afternoon and there were some good contests, with four matches going all the way to penalties. A JC Tackleway II player plays a pass against Sedlescombe Rangers II. In the Premier Travel Challenge Cup for teams in the Premier Division and Division One, the top flight’s top two went head-to-head in a repeat of last season’s final. This time the result was reversed as cup holders Battle Baptists lost 2-1 away to unbeaten league leaders Hollington United. The goals of Sam White and new signing Callum Smith won it for Hollington, who had fallen behind earlier in the second half to a Dale Vinall free kick. Hollington’s reward is a home quarter-final against Bexhill Town, who recorded a good 2-1 win at home to fellow Premier Division side Hawkhurst United. David Chan and Ross Cook got the goals for Bexhill, and Robert Briley scored for the Hawks. Two Division One sides overcame Premier Division teams, including Bexhill AAC, who came from 2-1 down to win 3-2 away to Sedlescombe Rangers. The JC Tackleway II on the attack against Sedlescombe Rangers II. Strikes by Andy Atkin, Aaron Tudor and Dave Carey’s second half winner enabled AAC to get the better of a Sedlescombe side whose goals were scored by Ryan Edwards and Matthew Shaw. The other second tier club to defeat top flight opposition was Mountfield United, who prevailed 4-2 on penalties away to Ore Athletic following a 1-1 draw. Mountfield’s goal was scored by their man of the match Nick Severino and Jamal Bsharah was on target for Ore.
Mountfield will visit Westfield II or Northiam 75, who will play their second round match tomorrow (Saturday), in the quarter-finals, while AAC will be away to Rye Town. 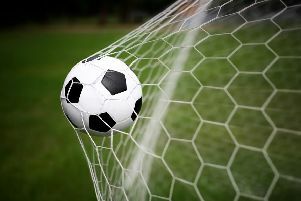 Rye recorded their biggest victory since being formed in summer 2016 with a 10-0 success at home to Hastings Rangers in a clash between the sides lying third in the Premier Division and Division One respectively. A Sedlescombe Rangers II player closes down a JC Tackleway II opponent. Richard ‘Alfie’ Weller banged in a hat-trick, Rob Levett, Craig Pierce and Ollie Skinner scored two apiece, and Sam Richardson got the other. Sidley United struck twice in the last 10 minutes to win 4-2 at home to St Leonards Social in an all-Premier Division affair. Arron Scrace, Chris Copley, Jordan Uttley and Josh Elliott-Noye scored for Sidley, while Greg Bennett and Billy Rixon netted for Social. In the quarter-finals Sidley will be away to Premier Division team Robertsbridge United, who won 3-1 away to Division One outfit Herstmonceux. Connor Benton Powell, Neil Gofton and Austin Galea hit the net for Robertsbridge, and Josh Sheldon scored for Ceux. Seven games were also completed in the Wisdens Sports Challenge Cup - for teams in Division Two and Three - and the form book was pretty much adhered to. The JC Tackleway II and Sedlescombe Rangers II battle it out at a wet Barley Lane. The closest of them was at Gunters Lane, where Bexhill Rovers edged out fellow Division Two side Mayfield 4-2 on penalties after a 3-3 draw. Adam Beeching, Luke Alais and Iain Stuart Powell scored for Rovers, who prevailed despite having a man sent-off. Rangers’ reward is a home quarter-final against Catsfield, who won 6-2 in an all-Division Three encounter away to Ticehurst. Charles Morgan (2), Jamie Bristow-Diamond, David Booth, Sam Harris and Jacob Jones were on the scoresheet for Catsfield, while Ben Turk and Darren Poole retaliated. Hollington United II, of Division Two, were the biggest winners in that competition after triumphing 7-1 away to a Punnetts Town side which is yet to drop a point in Division Three. Michael Shaw and Rhys Warren bagged two apiece for Hollington, whose other goals came from Daniel Andrews, Joe Murray and Dale Penn. Hollington will host Icklesham Casuals in the last eight after the Division Two leaders came through 4-2 at home to divisional rivals Battle Baptists II. Gary Thompsett and Adam Thompsett scored for the Baptists. A Sedlescombe Rangers II player gets away from a sliding JC Tackleway II opponent. Possibly the game of the day came at The Moor, where hosts Hawkhurst United II were edged out 6-5 by fellow Division Three side Victoria Baptists. The Baptists will again be on their travels in the quarter-finals, against St Leonards Social II, who received a walkover after scheduled visitors Magham Down were unable to field a team. Another all-Division Three contest ended in a 4-1 win for leaders Sedlescombe Rangers II away to The JC Tackleway II. A Chris Ford hat-trick did the bulk of the damage for Sedlescombe, whose other scorer was Toby Hicks. Daniel Banfield netted Tackleway’s goal. The stand-out result among the seven ties played in the Coopers Construction Challenge Cup - for teams in Division Four and Five - was a 14-1 victory for South Coast Athletico at home to Herstmonceux II. Jack Bloomfield and Connor Easton each netted five times for Division Four side Athletico, Luke Darvill bagged a brace, and there was one apiece for Ryan Fuller and Callum Homewood. Richard Dummer claimed the consolation for Division Five team Herstmonceux. Orington were also among the goals, winning 8-1 at home to Bexhill Broncos in a meeting between two of the top three in Division Four. Scott Quested fired in a hat-trick, Adam How struck twice, and one each for James McGrath, Daniel Hopgood and Aaron Lillycrop completed Orington’s tally. Orington will be at home in the quarter-finals against Icklesham Casuals II, who triumphed 3-2 in an all-Division Five tie away to AFC Hollington. Sam Haffenden and Aaron Hatton netted for Hollington, but Stewart Marshall’s double and one from Mason Maddox won it for Icklesham. Another all-Division Five affair went all the way to penalties. Wittersham II eventually prevailed 3-1 on spot-kicks away to Battle Baptists III following a 4-4 draw. Lee Costen (2), John Paul Ralph and Ashley Vora were Battle’s marksmen. In the last eight Wittersham will be away to Hampden Park, who also came through on penalties away to Sovereign Saints II. Park, who are unbeaten in Division Five, won 5-4 on spot-kicks after a 2-2 draw away to opposition from Division Four. Ninfield VFC avenged an 8-2 defeat at home to leaders Bexhill AAC II in Division Four a fortnight previously with a 3-1 victory against them in the cup. Michael Stephens, Lucas Mepham and Alex Southall were Ninfield’s scorers against an AAC side whose goal came from Matt Simmons. Ninfield will be away to fellow Division Four outfit Cranbrook Town in the quarter-finals after the Kent club inflicted a first defeat of the season on Division Five pacesetters Sedlescombe Rangers III. Aidan Aspinall scored for Sedlescombe in a 2-1 defeat. One game was played in round two of the Robertsbridge Charity Junior Cup and it produced a marvellous 3-1 victory for Division Four side West Hill United away to Bexhill United II, from Division Two. Tyler Smith, Matthew Wheeler and Daniel Wilkes were West Hill’s goalscoring heroes against a Bexhill team for whom Ben Packer hit the target. Six league fixtures took place across the various divisions, two of them in Division One. Northiam 75 went seven points clear at the top of the table, albeit having played a game more than the sides in second and third, on the back of a 4-3 success away to Little Common II. Scott Embery’s double, and one each for Aydin Janes and Oscar Garcia Cruz enabled Northiam to narrowly overcome a Common outfit whose goals were scored by Conor Chilton (2) and Patrick Brown. In the bottom half of the table, Wadhurst United jumped above Rock-a-Nore after beating them 6-2 at Washwell Lane. The one Division Two contest ended with honours even as Wittersham and Peche Hill Select played out a 2-2 draw - Wittersham’s fourth stalemate in eight league outings. The efforts of Tom Barlow and John Brice for Wittersham were matched by Ryan Rankin and Shane Friend for Peche Hill. Pebsham Sibex shot up to fourth in Division Three on the back of a 6-1 victory at home to Sandhurst. Dayne Beaumont and Nick Gamble scored two apiece, and one each from Charlie Sellens and Jared Beaumont completed Pebsham’s tally. Jamie Young replied for Sandhurst. In Division Four, bottom club Burwash picked up a useful point from a 0-0 draw at home to sixth-placed Parkfield. Northiam 75 II jumped two places off the foot of Division Five by dint of a 3-2 win at home to West Hill United II. Goals from Tom Powell (2) and Alex Neville earned Northiam their second league win of the season at the expense of a West Hill side whose goals were claimed by Michal Zemanek and Callum Beattie. A Sedlescombe Rangers II player slides in on a JC Tackleway II opponent.